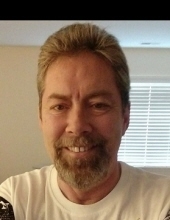 Beggs, Robert Alexander - Age 56, of Flint Township, died November 24, 2018. Services will be held 1 PM Sunday, December 2 at Sharp Funeral Home and Cremation Center, 6063 Fenton Road, Flint. Visitation will be held 11 AM until the time of service Sunday. In lieu of flowers those desiring may make contributions to the American Heart Association. Robert was born May 3, 1962 in Flint the son of Jerry Beggs and Dorothy Nugent. He was a 1980 graduate of Kearlsey High School. He was employed at General Motors for 32 years. He enjoyed playing hockey and golfing. He truly was loved by his family and friends. Surviving are: five children, Kendra Johnson of Rockwall, TX, Jared Beggs of Hohenwald, TN, Abbagale Beggs of Pueblo, CO, Andrew Beggs of Pueblo, CO, Anthony Beggs of Pueblo, CO; father, Jerry (Carol Ann) Beggs of Crossville, TN; siblings, Victoria (Stephan) Brochu, Paul (Susan) Beggs, David Dremer, and Elizabeth "Lizzy" Dremer Campbell (Barry Campbell); many nieces and nephews. Robert was preceded in death by his mother Dorothy "Dottie" Nugent. Tributes may be shared at www.sharpfuneralhomes.com. To send flowers or a remembrance gift to the family of Robert Alexander Beggs, please visit our Tribute Store. In lieu of Flowers please consider making a donation. "Email Address" would like to share the life celebration of Robert Alexander Beggs. Click on the "link" to go to share a favorite memory or leave a condolence message for the family.